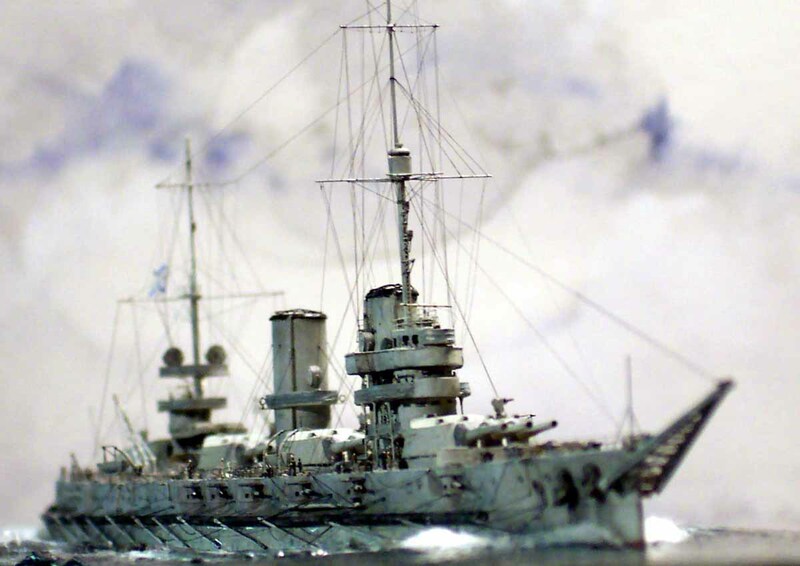 Financial and other constraints meant that they were not as fast as originally intended nor did they receive the 14in guns that were initially envisaged. 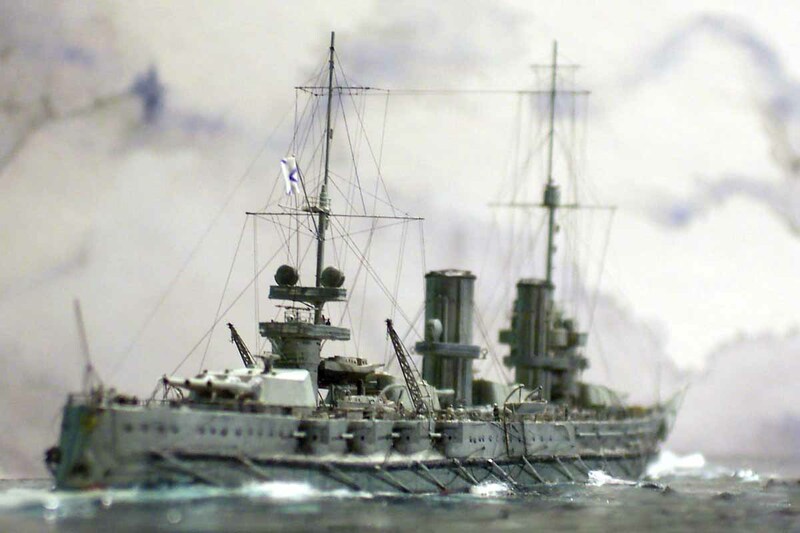 Commissioning 2 Dreadnoughts moved the balance of power in the Black sea to the Russian side and enabled the fleet to bombard Turkish and Bulgarian shore installations. 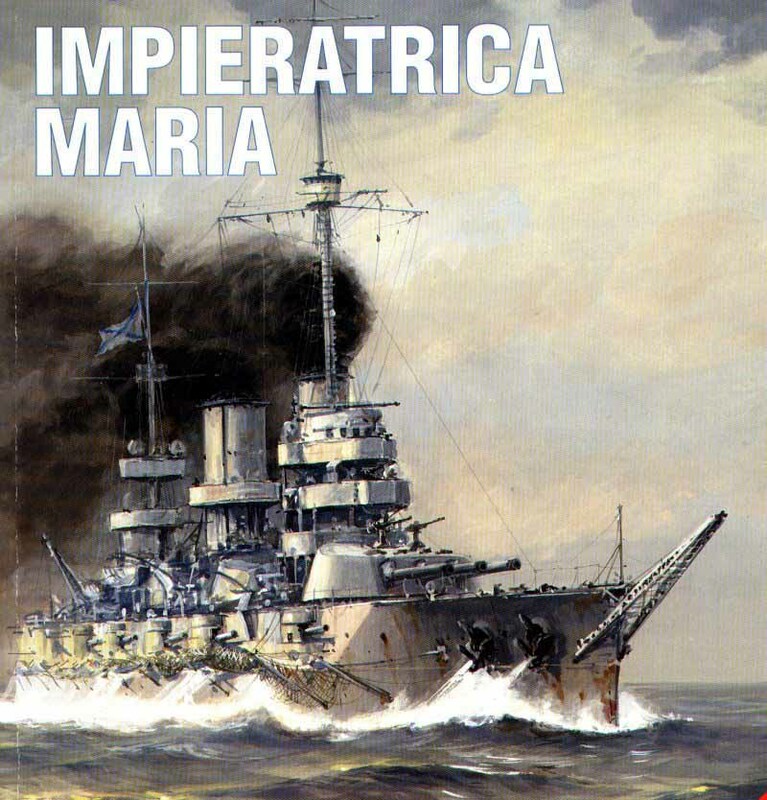 Imp Maria capsized at Sevastapol as a result of a huge internal explosion caused by unstable propellant. 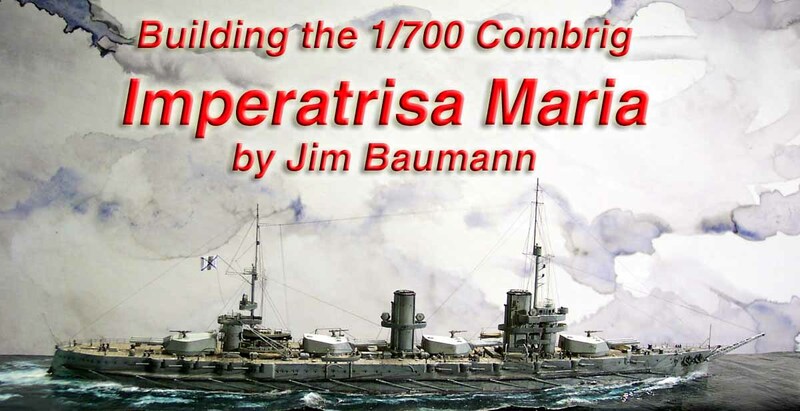 Imperatrisa Maria was launched in 1913, completed in 1915 and lost in October 1916..... armed with 12 x 12in and 20 x 5.1in as their main armament, and based on the externally basically similar Baltic dreadnoughts of the GANGUT class; the main immediate difference being that the centre fwd main turret points in the opposite direction to Imp M.
Unfortunately.... the drawing in the above monograph did not match the kit, specifically the distance of the aft mast from the aft superstructure as well other minor discrepancies, this was verified by photos of the actual ship within the book. 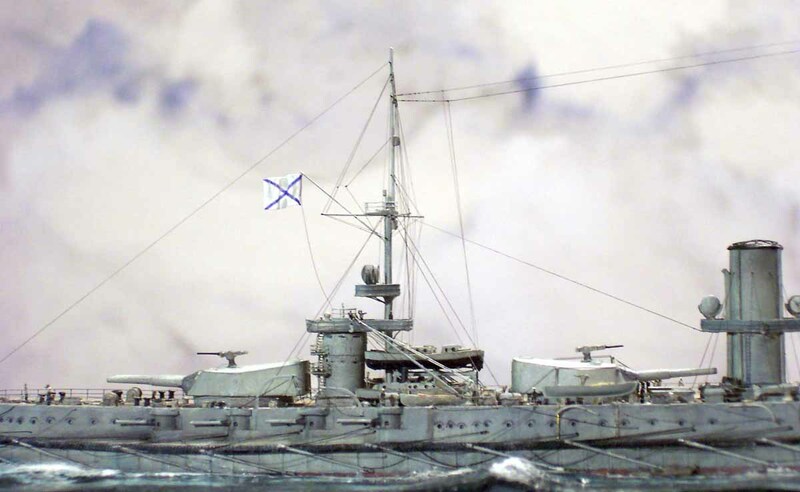 The kit came with a drawing also to be found in the book'Dreadnoughts of the Black Sea' (Russian text) by BA Eisenberg and W W Kostritchenko (I got my copy from Pacifc Front Hobbies) The kit agreed with this drawing as well as the photos I could find so I chose this route as being more verified... 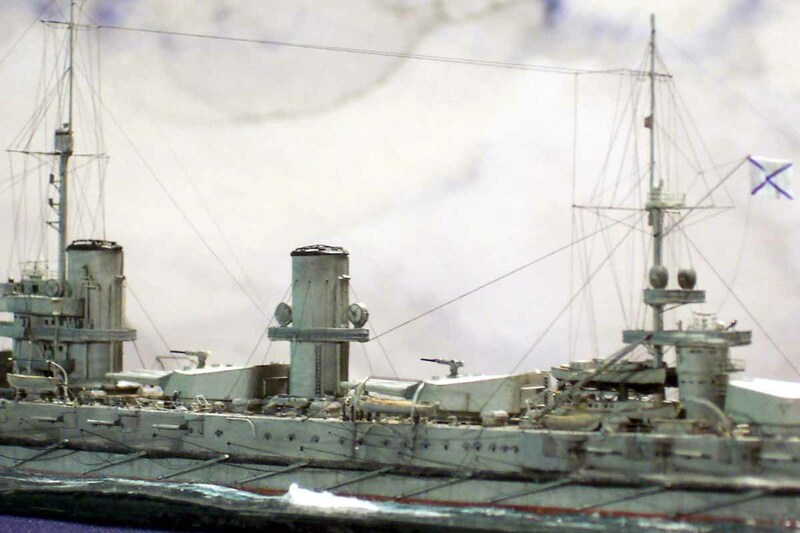 The strange thing is that while initially it seemed I had lots of information it actually transpired that most of the pics were long distance or fuzzy/poor reproductions or sisterships and as such some guesswork was involved. 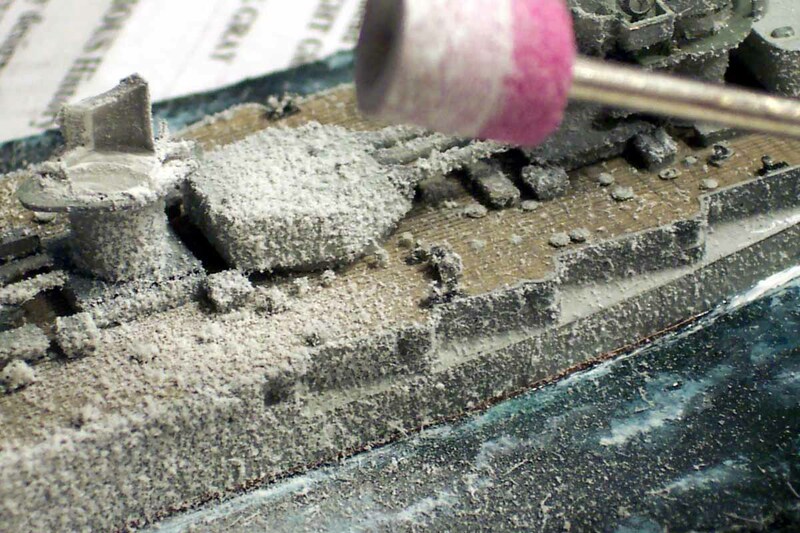 On inspecting the kit the first thing that was apparent was how empty and devoid of surface detail the deck seemed, no vents or coal scuttles. 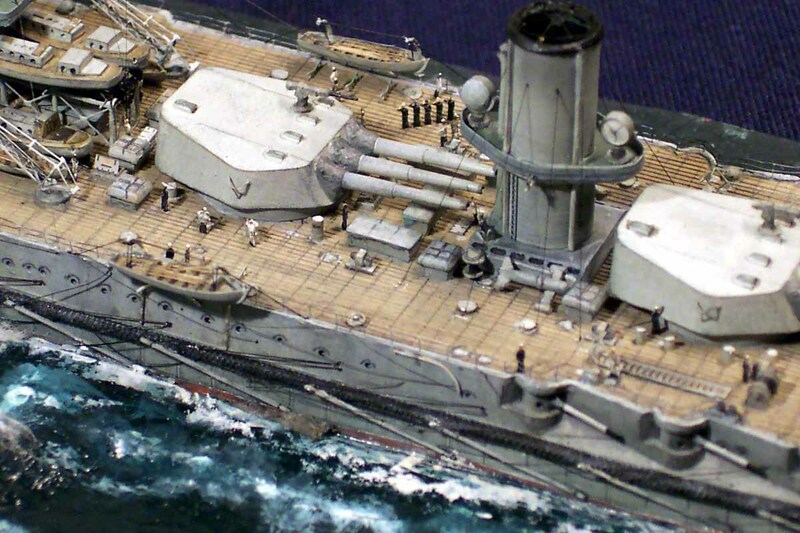 In addition the decks were planked athwarships at intervals in common with many ships of the RIN. 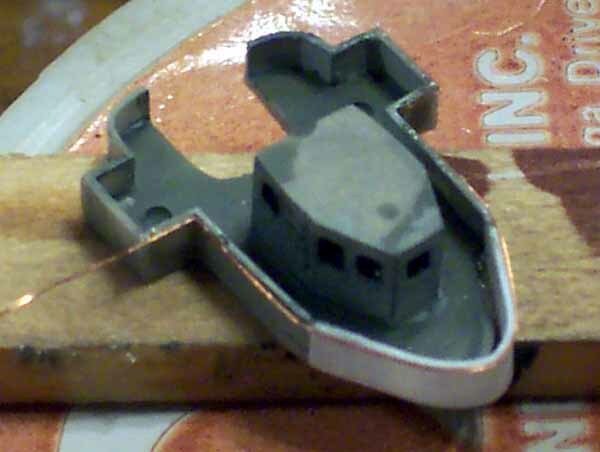 This was pencilled in lightly so as not to overwhelm the fore and aft planking; this would be easy if one started with a totally flat deck without vents and barbettes...however...! 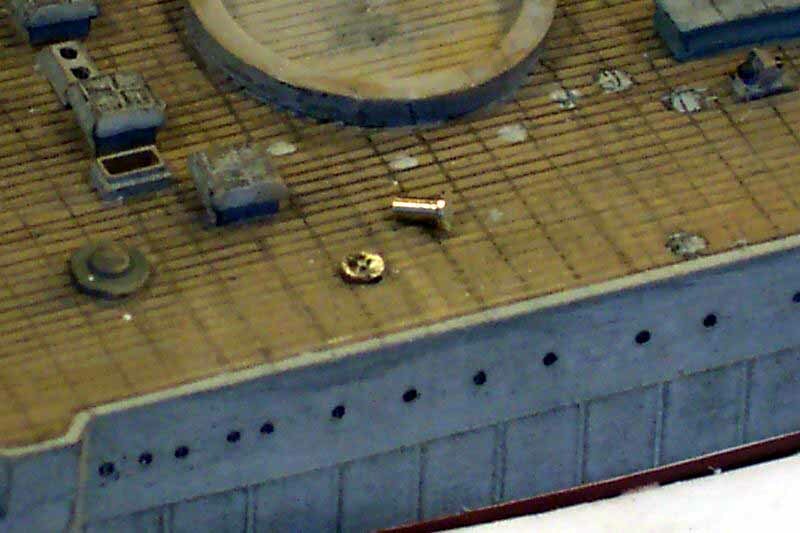 I next turned my attention to the fwd and aft bridge structures. 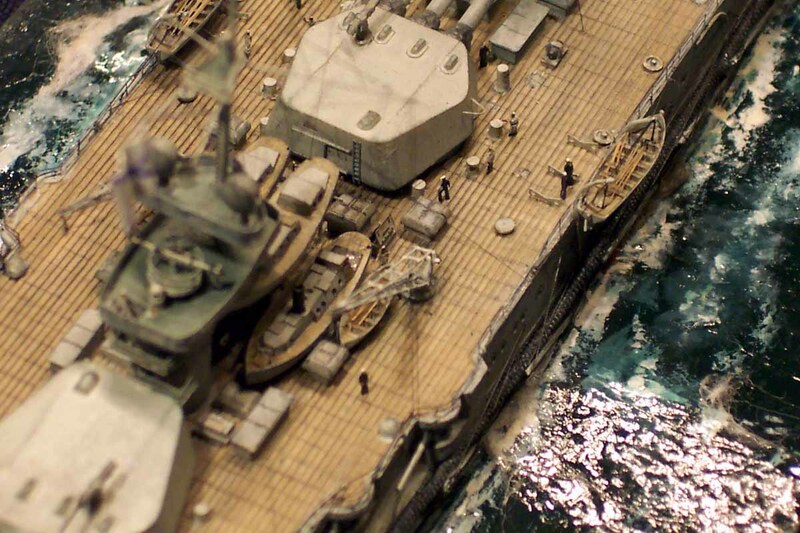 All solid splinter shields were removed and replaced with brass or railing with canvas dodgers as appropriate. 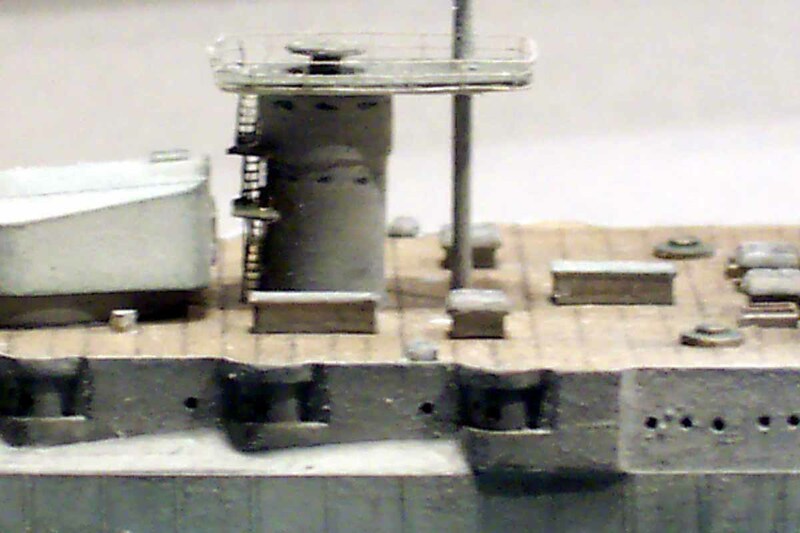 The upper bridge platform did not extend sufficiently far fwd so the side splintershields were extended and a new floor made. 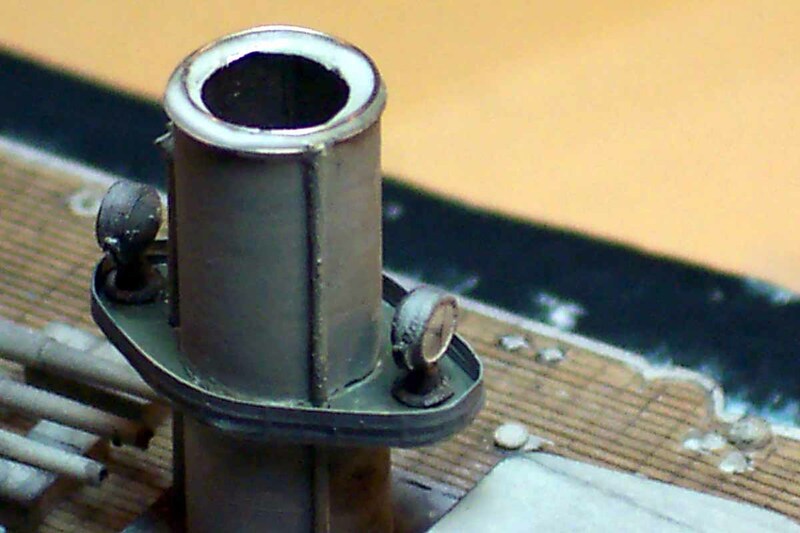 The 'lip' at the top edge was added in thin brass wire. 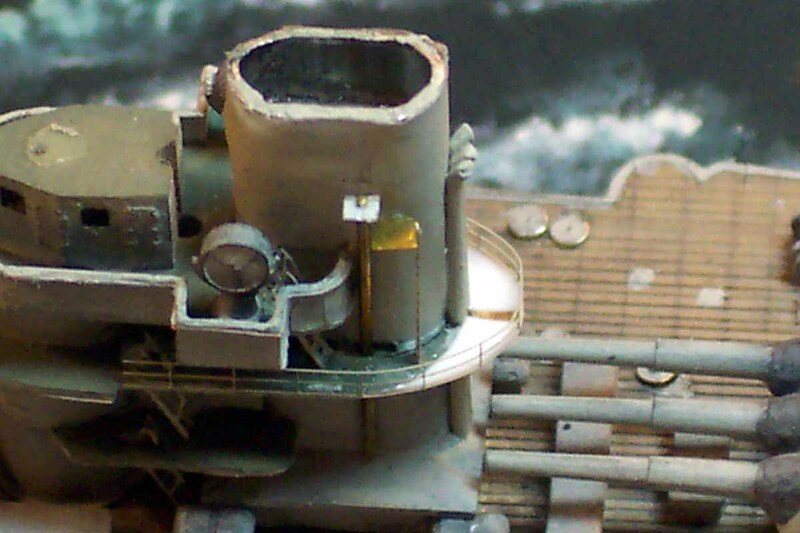 The second platform did not appear to extend far enough aft around the funnel so this was also enlarged with a new floor .All the stairway apertures were cut and the stairs installed. 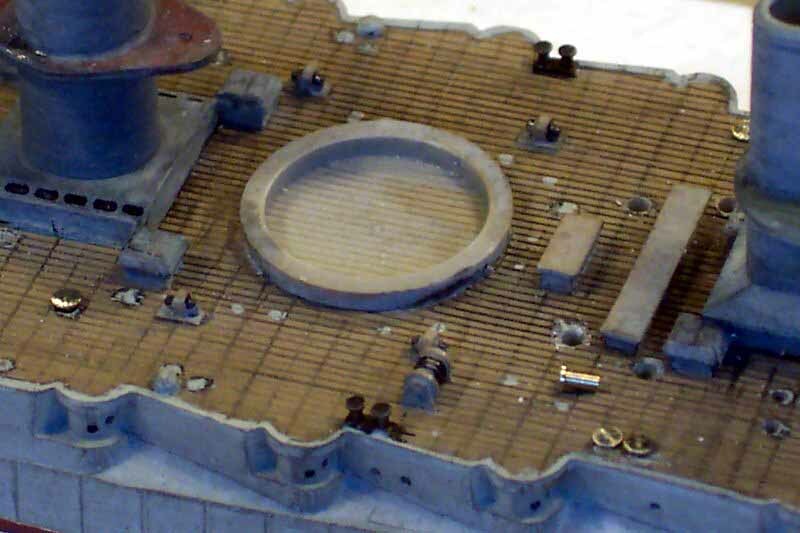 The vertical stanchions on the fwd bridge twixt the decks were cut from brass PE 1/350 pulley sets with the gusset plates being white glue painted.The aft towerstructure had numerous stair levels, these were very fiddly to make and install but add greatly to the overall effect. 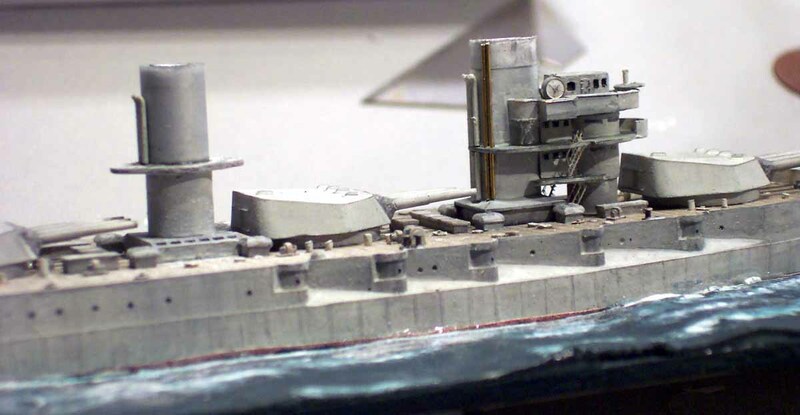 New larger aft platform was made to allow mast to be set the correct distance from the aft tower. 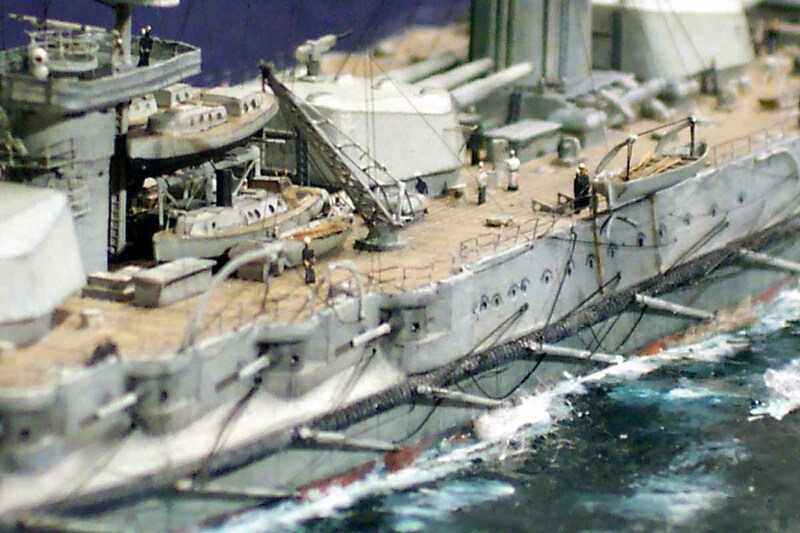 It was while assembling the fwd tower structure I realised that in comparison to photos the fwd and centre funnels were too short in relation to the towers... once again I SHOULD have planned ahead... (and spotted it at the dry fit!?!) 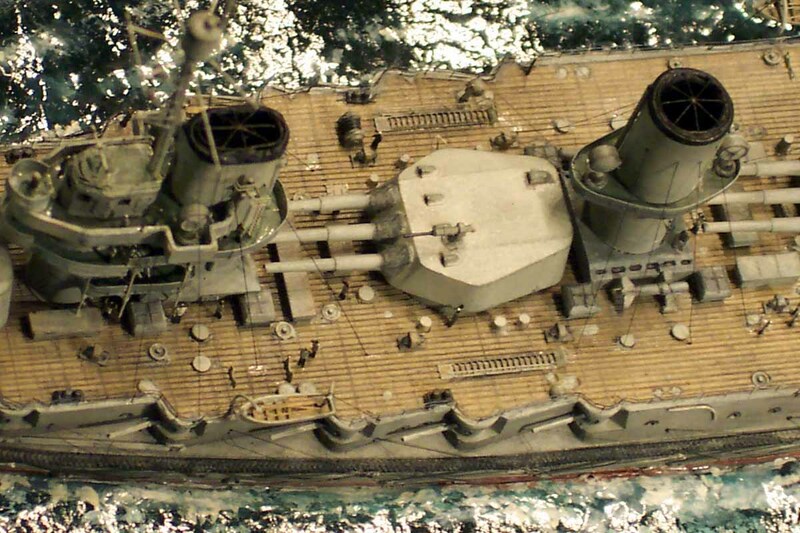 But nevertheless decided to extend the funnels in situ as they were now inextricably attached to the deck and fwd Bridge tower. 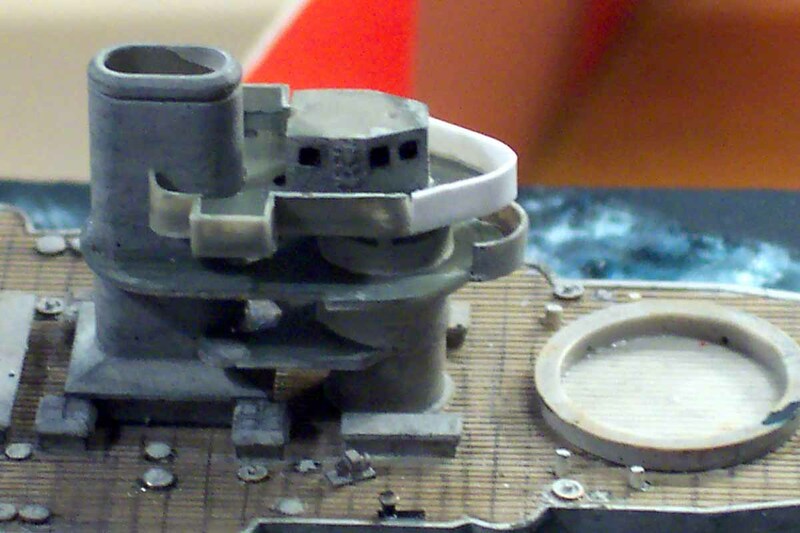 With the motor tool I ground off the two funnel tops and extended them with alloy tube wrapped in gummed paper to bring the diameter up correctly.... the photos how how I madethe new funnel top flanges with wire circles and white glue. 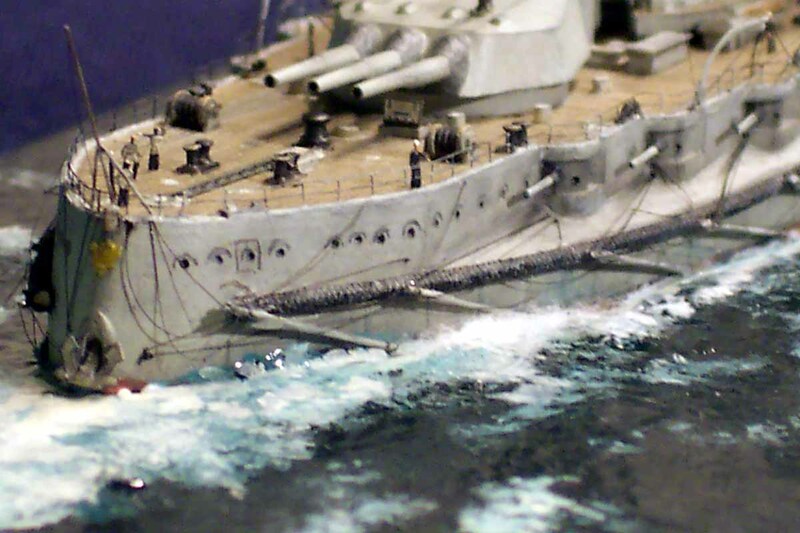 The kit came complete with a small etched fret containg among rails(clunky) the distinctive Bow crane used I believe in Paravane operations... at first sight it seemed great, checking with photos showed it neede work. The side members were supplied as solid,the photos show a fine lattice work... I cut down the existing top and bottom and added lattice sides cut from GMM Chiyoda crane set and labouriously fiddled them to shape. 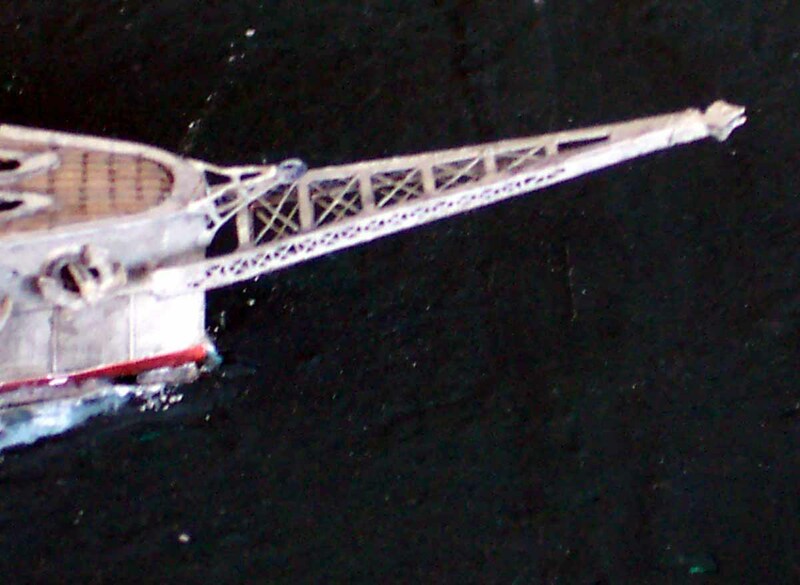 I scratchbuilt the pullet gantrey on the bow as the supplied was overscale(photo 1276).This added greatly to the delicacy of the bow. 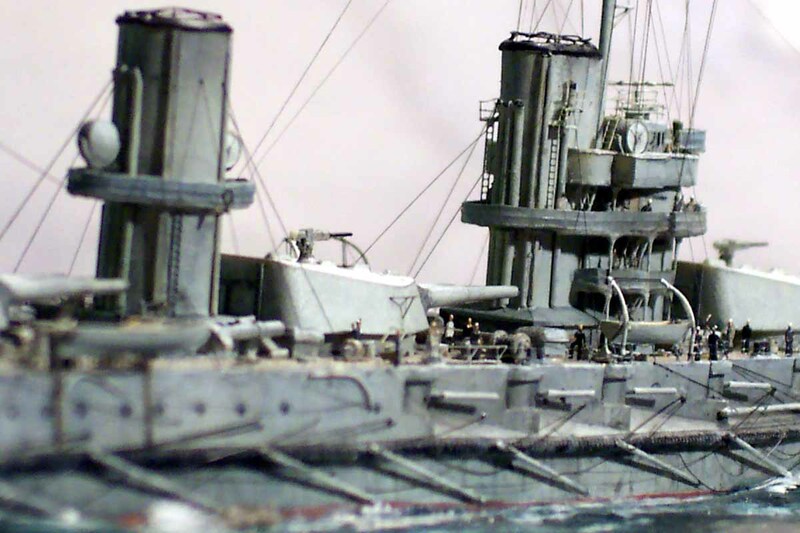 The etched boat cranes as supplied were overscale and did not have enough lattice work according to photos, I used some Toms Modelworks IJN carrier radio masts doubled to give depth. 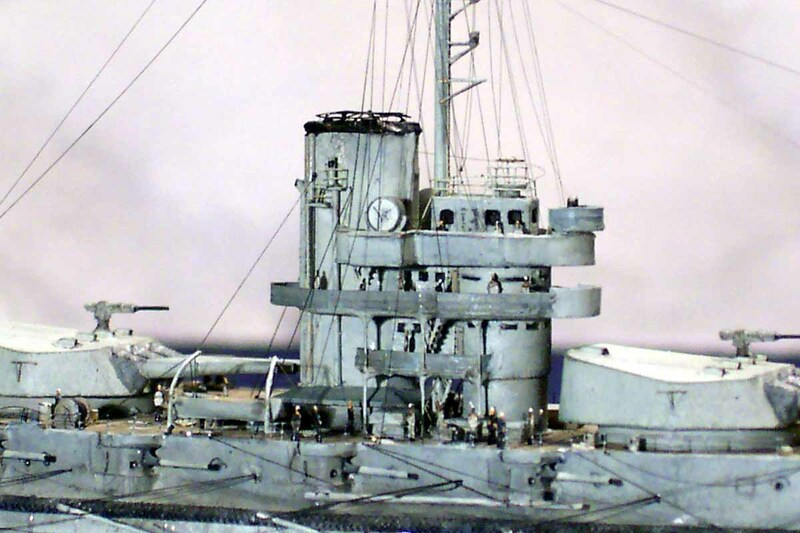 The fwd mast lookout was used from the kit, but was cut open to give see thru effect and installed on new metal masts The torpedo net was thin elastic cord drybrushed to bring out the weave, this worked quite well once the booms were installed and rigged. 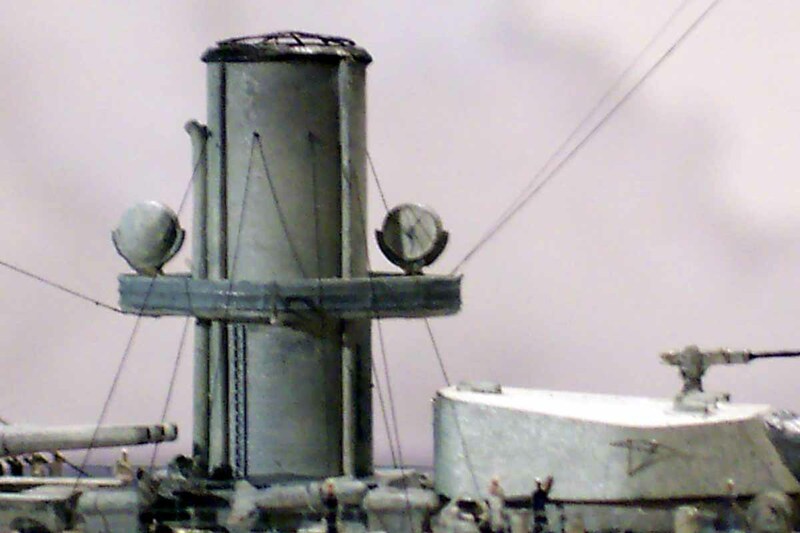 All Rigging is stretched sprue tightened with smoke as per my usual method.